The Itomak TM bowl is a novel centrifugal concentrator developed by SMA ITOMAK [184,185,186], a company spun out of a Novosibirsk scientific centre: www.itomak.com. The bowl is riffled and spins tilted in smaller modelsand horizontally with the larger models, unlike western bowl centrifuges – Knelson TM, Falcon TM, Knudsen, Neffco TM, Goldkatcha TM etc – whose bowls spin round a vertical axis. The larger Itomak TM bowls resembles the Chinese Yunxiand SLS bowls that spin round a horizontal axis. The horizontal attitude has some advantages, such as the rotary mechanism being above the water when atrest. The smaller Itomak TM models (KG-0.1 and KG-1.0) are for upgrading. Concentrate screened at <2mm is fedmanually into the hopper above the centrifuge. Water is added via a hand-held spray to create slurry that flows down a slurry pipe to discharge close to the bottom of the inside of the bowl. Here the slurry collides with a raised discharge plate that has six oblique tangential extensions to help fling the solids to reach the base of the riffled wall of the centrifuge. The rotor rotates at 1,250 rpm in modelKG-01 and 700 rpm in the some what larger model KG-1.0.Injection of fluidisation water helps prevent packing of the riffles. 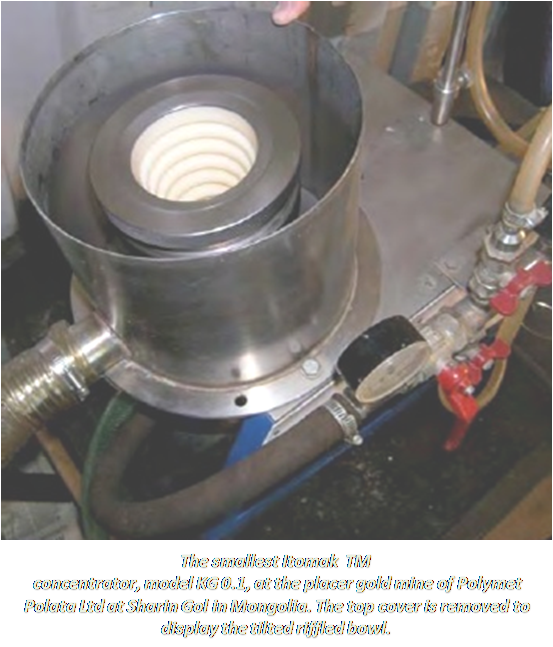 The smaller Itomak TM models (KG-0.1 and KG-1.0)are distinctive and probably unique amongst centrifugalbowl concentrators in that the bowl is tilted out of thevertical and the centrifuge therefore spins around aninclined axis of rotation.The larger Itomak TM models are designed for the finalstage of a wash-plant. Depending on the model they canprocessing 2-15m 3 of solids. Slurry screened at <3mm isfed via a slurry pipe to discharge at the ‘far wall’ of the spinning bowl. The bowl rotates in the horizontal plane, again differing from most western bowls. The rotor rotates at 500-650 rpm to slam the slurry against the wall of the bowl. Injection of fluidisation water helps prevent packing. Itomak TM bowls, large and small, are stopped for batch discharge of concentrate. 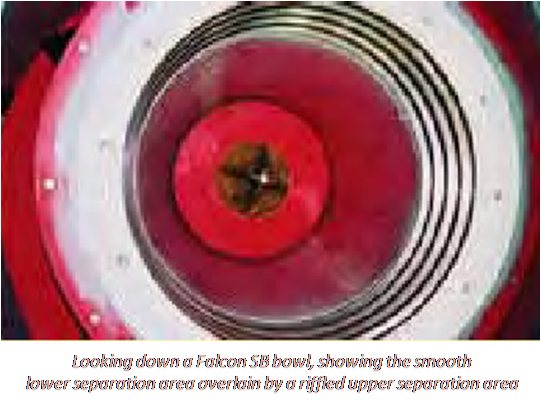 The Falcon TM Superbowl (SB) was invented by SteveMcAlister to complement the original Falcon TM B bowl. The new SB bowl was tested on a placer gold deposit in British Columbia and patented in 1995 (US #5,462,513) [125,153]. The floor of the Superbowl has an impeller, and the lower two-thirds of the wall are a smooth ‘migration zone’. However the upper third of the wall bears horizontal riffles with pores for water injection in the intervening grooves, acting as a ‘retention zone’. This is based on the elutriated centrifugal bowl patented 50 years before by Arnold Nesbitt McNicol in Australia (AU#17487/34 and AU #22055/35). Recovery of fine gold by the Falcon and Knelsonbowls are somewhat similar [125,134,140, 142,145,180-183]. The feed is screened at 2-6mm and fed as slurryfrom above via a slurry pipe that discharges near the bottom of the bowl where it is flung by an impeller towards the wall. Rotation is very fast to achieve 50 to 300g and this slams the concentrate against the wall and induces density stratification of the slurry. Upon rising up the outwardly sloping wall, the stratified slurry passed over a concentrate bed fluidised from behind by back-pressure water. The fluidised bed enables the Falcon SB to process and retain particles in the concentrate bed in preference to lighter minerals that are ejected as continuously discharging tailings. The Falcon SB achieves a concentration ratio of 1,000 or more and so the volume of concentrate is low. Periodically the feed is stopped to permit the concentrate to be rinsed out of the bowl as a batch discharge. A typical operating cycle is 2 to 4 hours. Recently Falcons have been awarded a patent for continuous discharge (US #6,796,934).